When I told my friends that I was visiting Sukhothai Historical Park, an ancient city located in Northern Thailand during a short holiday, many had asked exactly what there was to see. To most, the idea of exploring ancient ruins in Southeast Asia has probably become synonymous to a visit to Angkor and only Angkor. Even other deserving places such as Bagan and Borobudur become relegated to an afterthought. But Sukhothai was stretching it – barely anyone recognized it. It was precisely for this reason that I could not find any references for the place. I wondered whether it was still worth visiting. The few photos that I found online piqued my interest. That more or less sealed the deal. During a trip to Chiang Mai and armed with no expectations, I went for an overnight stop in Sukhothai Historical Park. “M-TSKHE-TA,” I shouted, pointing furiously to my guidebook. It was our second day in Georgia and the plan was to visit this UNESCO World Heritage town only a few minutes away from Tbilisi. We were at the bus station and no one around us could seem to understand a word we were saying. It didn’t help that everything was in Georgian writing, which is totally alien to me. They don’t even use Cyrillic like the Russians and they have their own alphabet. We would have been toast and left to board some random car that could have been headed to war-torn South Ossetia had it not been for this helpful chap. “Oh, you are going to Skheta?,” he asked. Apparently, the first two letters of this town’s name are supposed to be silent. He directed us to a row of parked minivans. The most popular mode of long-distance transportation in Georgia are actually not public buses but these speedy contraptions called marshrutka – a legacy of Georgia’s Soviet past. For 1 Lari (approximately US$0.60), we boarded one of these to Mtskheta which was just 30 minutes away from Tbilisi. … and I’m not talking about Sentosa here. What most people don’t realize is that Singapore isn’t just made up of just one island (or two, if you count Sentosa). Believe it or not, this tiny city-state is actually made up of 63 islands — most of them being uninhabited! I had the chance to check out some of these islands last year with friends and it showed me yet another side of Singapore that I hadn’t known previously despite living here for several years. A short ferry ride from the Marina South Pier via Island Cruise (SGD 15, roundtrip, inclusive of stops) transports one from the hustle and bustle of an ultramodern city to tiny, mythical tropical islands lined with lush palm trees and some of the best beaches in Singapore. The ferry ride took us to three of the more well-known southern islands (aside from Sentosa). First stop was the larger St. John’s Island – a great getaway for those planning for a swim and/or a picnic. As Burma was in my Top 3 countries to visit, I decided to finally push through with this trip last month. I had arranged with a travel agency based in Burma for domestic plane tickets and accommodations as it was cheaper that way. After months of going back and forth on plane schedules and suitable places to stay, we finally landed in Rangoon (Yangon) on a misty morning during Christmas Day. The first thing I noticed as we exited the airport was how most men wore skirts. Burma has been relatively isolated since it gained independence from Britain in 1948 so the people still maintain their traditions. The skirt is called longyi and it’s actually a versatile form of dress worn by both men and women. The second thing I noticed was how green Rangoon was compared to many other Southeast Asian cities. The roads are tree-lined, and there are many parks dotted around the city. In Downtown Rangoon, the streets are also laid out on a grid so it’s easier to find your way around. 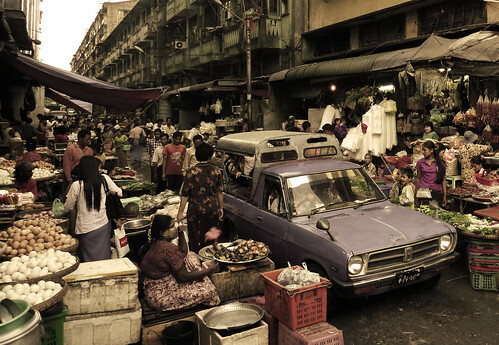 Although home to about 5 million people, Rangoon itself does not feel like a big city. The pace is quite relaxed and there’s not a lot of cars on the roads. Neon lights are a rarity here. The trade embargoes are very much evident with the lack of international brand names – for some reason though, Bossini is very popular in Rangoon. Most cars are disheveled and are literally falling apart. The taxis consist of outdated models such as Isuzu Gemini and Toyota Corolla from the late 70’s to the early 80’s. Needless to say, there’s no airconditioning. It’s practically a miracle how they manage to run these contraptions after several decades of use. That day happened to be Christmas Day so most shops were closed. We started the day by having a walking tour of downtown Rangoon, which still has a lot of buildings dating from British colonial rule. This include the Strand Hotel, which is Rangoon’s version of Singapore’s Raffles Hotel or Manila’s eponymous hotel. 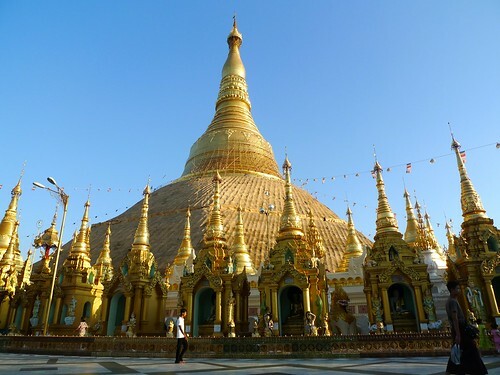 In the afternoon, we visited the Chaukhtatgyi Paya with its famous reclining buddha as well as the main attraction – the Shwedagon Paya. It was truly an amazing sight, and I was at awe with the gold-encrusted main pagoda that stood out even from a distance. The place was packed with tourists and locals alike, and it was a great way to just people-watch. It was a hodgepodge of human activity. In one corner there would be people praying and bowing their heads to the Buddha while in another, a group of German tourists would be taking snapshots of the fine architecture. Shwedagon was a relatively big complex so we spent some time circling it – there were several other altars and mini-temples with dozens of Buddhist images. There were a couple of notable banyan trees near the edges that were supposedly transplanted from the place in India where Buddha gained enlightenment. 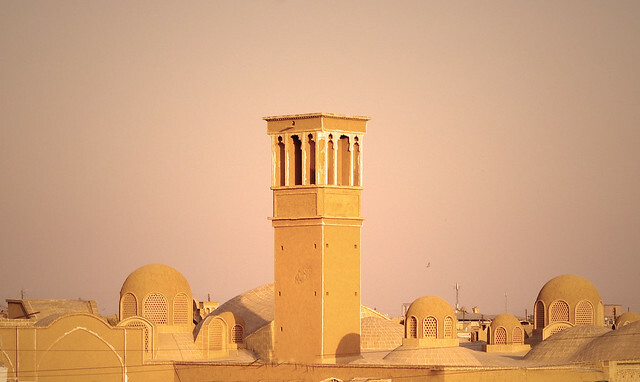 Gold was the prominent color and it was evident in almost every structure that made up the massive complex. We had dinner at this Chinese restaurant owned by a Singaporean. The owner told us how he ended up starting a business in Burma – because it was extremely competitive in Singapore and it was difficult to make money there. What he said was true in a sense – this is why most Singaporeans end up in the corporate world rather than set up their own businesses. Those who do set up their own gig find themselves facing head-to-head competition, especially in the food and beverage industry. But I digress. Moving back to Rangoon. 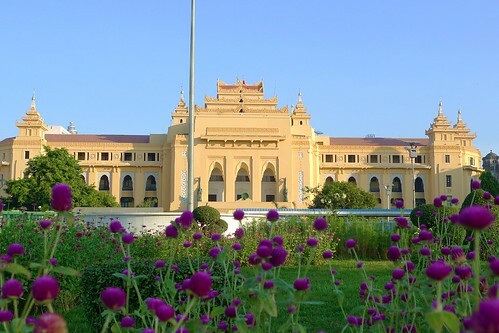 rangoon city hall – with a fresh coat of paint! The next day was spent walking around Downtown Yangon. We started at the Strand Hotel, a fine colonial building that’s reminiscent of Singapore’s Raffles Hotel. We walked towards Sule Paya, an attractive Buddhist pagoda right smack at a roundabout. This walking tour ended at Bogyoke Aung San Market, where all sorts of handicrafts and Burmese souvenirs were sold. There wasn’t anything we particularly liked, although shops selling rubies, diamonds and other precious and semi-precious stones were in abundance. We also found this market to be a good place to change Kyats (Burma’s local currency). We had nothing to do that afternoon so we decided to visit the Gems Museum. Among the things they had for display was a sapphire measuring several hundred carats, rubies, emeralds, diamonds and all sorts of treasures that attested to Burma’s wealth in natural resources. Interestingly, the display was also a sad reminder of how a country can at once be rich and extremely poor. Looking back, the 2 days we spent in Rangoon was excessive. One full day should have been enough, and the extra day could have been better spent elsewhere in the country. But it was a great introduction to Burma nonetheless. How to get there: Most popular method is to go through Bangkok where Thai Airways and Air Asia have direct flights to Yangon. An alternative is to go through Singapore where Jetstar Asia and Silkair fly to Yangon. 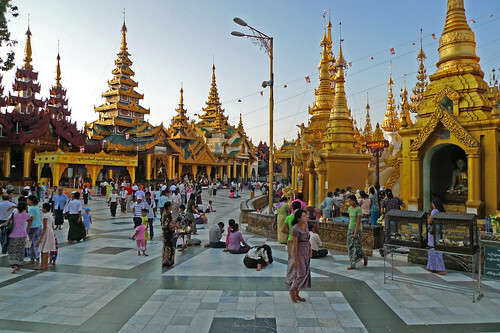 Best time to visit: December and January are supposed to be the most pleasant months to visit Burma. In Yangon however, we found the heat to be unbearable from noon up until 4pm. Temperatures vary considerably within the day. Normal morning temperatures in December average at a cool 16 to 18 degrees celsius, while afternoon temperatures reach 32 to 35 degrees celsius.